I fall into the category of people in the world who aren’t particularly fond of chocolate. More of a savoury than a sweet tooth. So when Easter rolls around and everyone is buying chocolate eggs of all shapes and sizes, it’s a little bit lost on me. Apart from Kinder Eggs (those things are amazing). So what do you get for the person who isn’t into chocolate for Easter? Just ask my mum, who decided to buy the most extra ‘Easter’ gift of all time. Cue ‘The Beauty Egg Collection’ from Lookfantastic, a cute blue box filled with the contents of a Game of Thrones spin off. Just kidding, (although it did have the vibes - I mean a box full of golden eggs??) 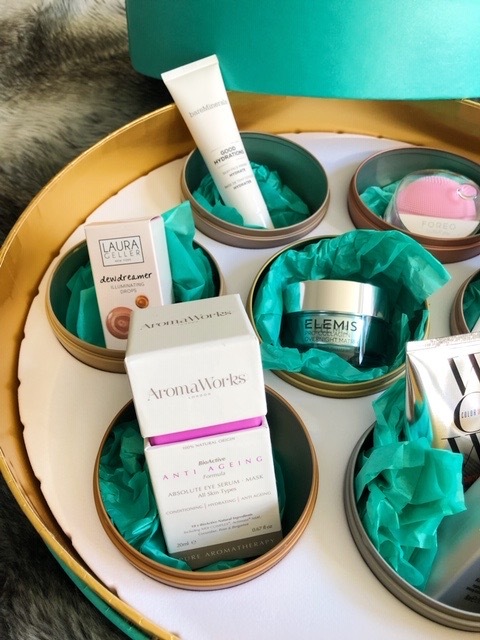 It seems like quite a few beauty brands are jumping on the success of beauty advent calendars and adding on an Easter treat for those of us who love our skincare. L’Occitaine has some Easter related gifts out too, but the Lookfantastic box just seemed like such good value - it costs £65 and is worth around £250. The box contains seven little eggs, each with an exciting piece of skincare inside. Much more up my street than the chocolate version. I can’t wait to try everything (have to wait until Easter of course), keep reading to find out what’s inside! I have to say I’d seen these around, and always quite fancied giving one a go. The play version is teeny tiny and super compact and perfect for travelling - so long as the thing doesn’t turn itself on and start vibrating as you’re going through customs! The cleansing brush is battery operated and good for 100 uses. The only downside is that once the battery has run out, it’s game over and you can’t recharge/replace. This seems just a bit wasteful to me, although it might encourage me to purchase the full size one. It’s geared toward those with congested, acne prone skin, and I love that the silicone makes it super hygienic. I can’t wait to give it a go. Check it out here. This cream covers the cost of the entire box in one go, retailing at almost £90, and Elemis is one of those brands I always know I’m going to love. Since I’ve been approaching the 30-line, I’ve noticed my skin beginning to change and age a little more. Believe me when I say I’m doing everything I possibly can to slow this process down, and if slathering myself in Elemis creams every night will do the trick then you know I’m going to be buying stocks in the brand. Their reputation stands before them, and although I haven’t tried this particular product, everything else I have tried has been amazing. Check it out here. If I’m being totally honest, this was the one product in the set that I wasn’t very excited about. Although I’m mostly all about skincare, I obviously do wear makeup and enjoy shopping for it. However, the ‘strobing’ fad completely passed me by, and I’ve never been a fan of anything super shimmery on my face. Especially thanks to the fact that I am so pale that anything on top of my foundation tends to just make me look like a disco ball…in the bad way. I’ll be popping this on my Depop shop so that it can go to a better home - @emmagraceblog on Depop if you fancy it for yourself! Check it out here. Since my dark circles are my enemies, and I’m never going to be the kind of person who gets enough sleep, I was excited to see an eye product in the set. It smells like a spa and promises to rejuvenate my undereyes, so obviously I’m sold. With a good hit of hyaluronic acid, this night owl should start looking like I've had a full eight hours every night, even when it’s actually been about five! Check it out here. Sadly the shampoo was another product that’s a little lost on me, though not Lookfantastic’s fault at all - I just don’t colour my hair. This was happily passed on to my mum, who was excited to give it a shot. Check it out here. The spray on the other hand was right up my street. My hair can be frizzy, knotty and just generally unmanageable sometimes - especially in summer heat. When I’m on holiday, in and out of the sea/pool it can just totally rebel. This spray promises to humidity proof hair - the dream - and combat frizz. It’ll be going straight in mu summer travel bag - I have high hopes for it. Check it out here. I had never heard of this brand or this product, so am excited to give it a try. My skin is quite oily, and can become super dull and congested, so the fact that this bar is packed full of ingredients like Dead Sea Mud and charcoal are huge green lights for me. The packaging is gorgeous, and this will be living in my shower (maybe to be used alongside my Foreo?) By the looks of things My skin will be a lot less congested and dull - hopefully more balanced and fresh looking. I’ll report back! Check it out here. As I said, I’m more of a skincare junkie than a makeup junkie, and primer has always seemed to be that kind of in the middle thing that I never really bothered using. I love bareMinerals though, and have been meaning to try using a primer for absolutely ages, so what better place to start? My only issue is that fact that this primer is geared toward those with dry skin (mine is combination at best, oily at worst) and might not work for me. I’m planning to give it a good try, and if it doesn’t agree with me I’ll be passing it on. Check it out here. All in all, I’d say I did well out of Easter for someone who isn’t a chocolate fan. I can’t wait to try out some of my new products, and was glad to be able to share! All of my empty products are posted on Instagram Stories (@sundayicon) with reviews/thoughts.